June 26, 2015 By This post may contain affiliate links. It’s all about ice cream around here this summer. When I’m hot, I want ice cream, so I just can’t stop making frozen treats. Unlike all the decorated ice cream cones I’ve been making lately, this dessert will require that you turn on the oven. 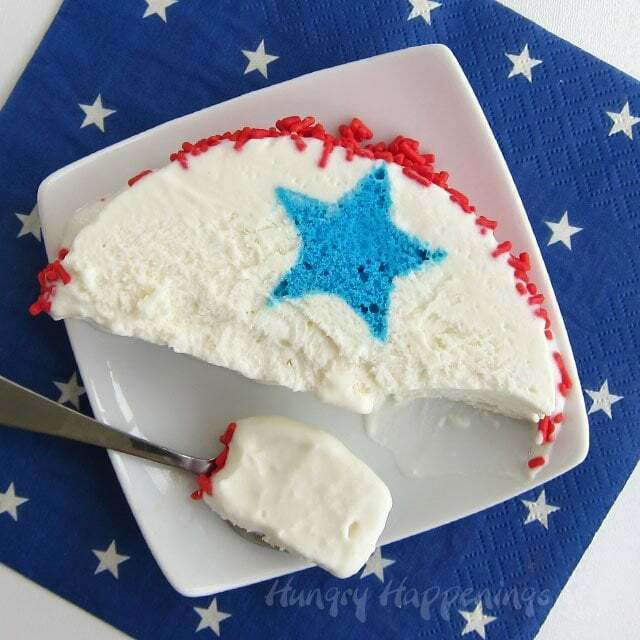 That blue star in the middle of the bright white ice cream is cake. Fortunately the cake you’ll need to bake is really thin and bakes up really quickly, so you wont have to heat up your kitchen for too long. Once the cake is baked, cooled, and frozen, it’s time to make the ice cream. 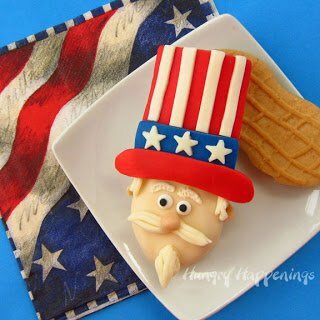 I suppose it would be possible to make this 4th of July dessert using softened store bought ice cream, but why bother, when you can whip up this no churn ice cream in just a few minutes. 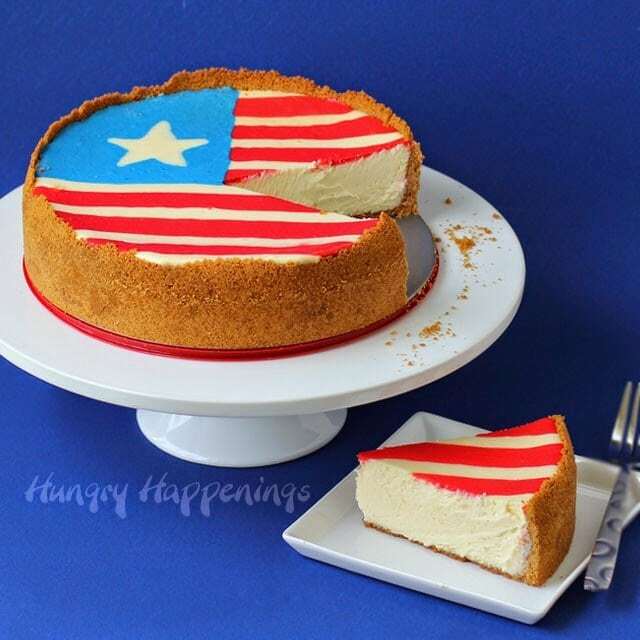 Just whisk some whipped cream, stir in a can of sweetened condensed milk, and you have a mixture that can easily be piped around the cake stars and that will freeze up beautifully. To keep this ice cream roll from melting too quickly on a hot summer day, I decided to add a bit of melted white chocolate to the sweetened condensed milk to give the frozen roll a bit more structure. To ensure the center of this dessert would be vibrantly white I chose to use Bright White Candy Melts, but if you don’t mind an off white center, you can use pure white chocolate instead. 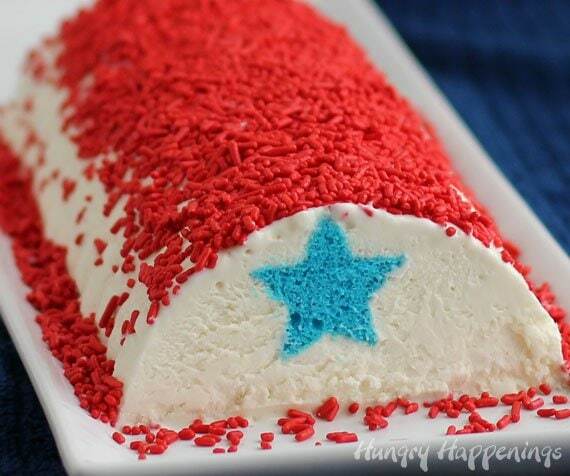 Being this dessert needed a pop of red, I simply covered the ice cream roll with red sprinkles. It added just the right color and a little bit of crunch. 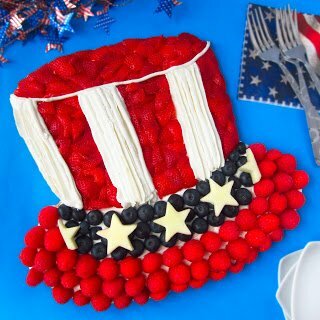 When you cut into this 4th of July dessert, you get a bit of red, white and blue in every slice. Line a 9 x 13 pan with parchment paper. Spread cake batter in pan. Bake for about 18 minutes until a toothpick inserted in the center of the cake comes out clean. Allow the cake to cool in the pan for 10 minutes, then remove from pan and set on a cooling rack. Allow to cool for 30 minutes, then place in the freezer for at least one hour until firm. Remove cake from freezer, peel off the parchment paper and set cake on a cutting board. 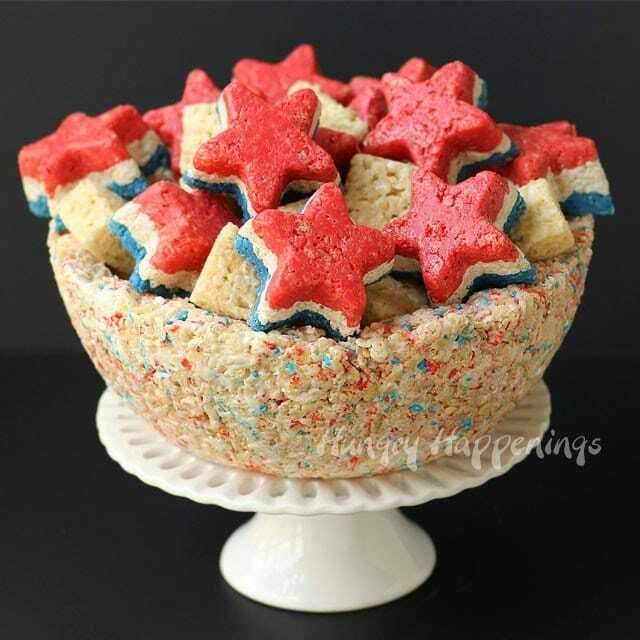 Cut out 1 inch stars using a metal cookie cutter. Place the cut stars back in the freezer, once again, until firm. Note: You’ll use a little less than half of the cake for this dessert, so you don’t need to cut the entire thing into star shapes. Once the blue cake stars are frozen, it’s time to make the ice cream. 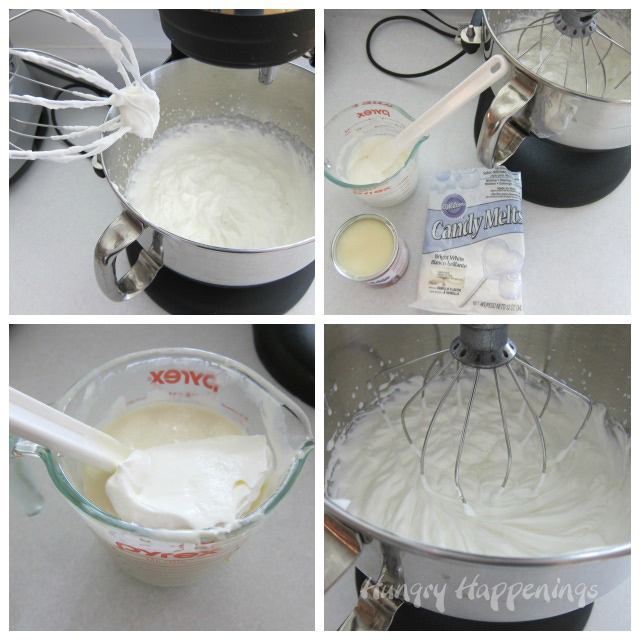 Pour the heavy whipping cream into the bowl of a stand mixer or in a large mixing bowl. Beat on high to stiff peaks. 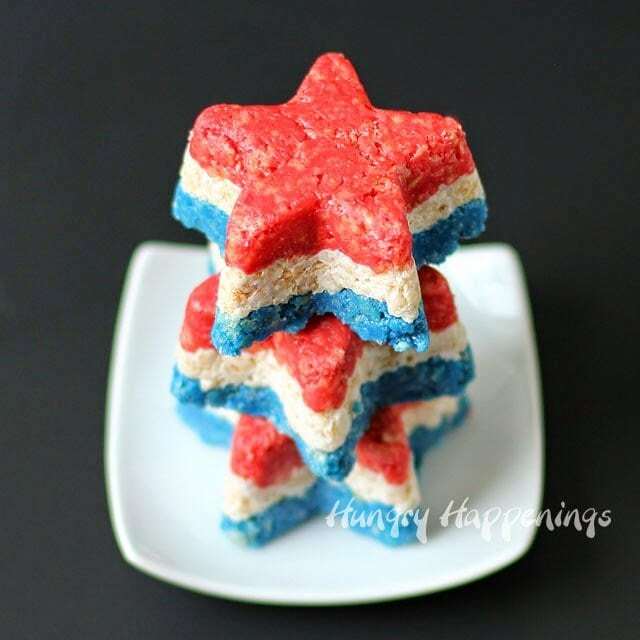 Pour candy melts into a small microwave safe bowl. Heat for 30 seconds on high, then stir. Heat for another 30 seconds, then stir. Continue to heat at 10 second increments, stirring after each, until melted. Stir in the sweetened condensed milk. If the chocolate seizes and you get small hard bits in the mixture, heat in the microwave for 10 second increments, stirring after each, until melted and smooth. If hot, allow this to cool so that it feels cool to the touch. Spoon in about 1/2 cup of whipped cream and stir until smooth. Pour it into the whipped cream and beat until well combined. Line the Rehruecken pan with non-stick tin foil for the easiest removal. 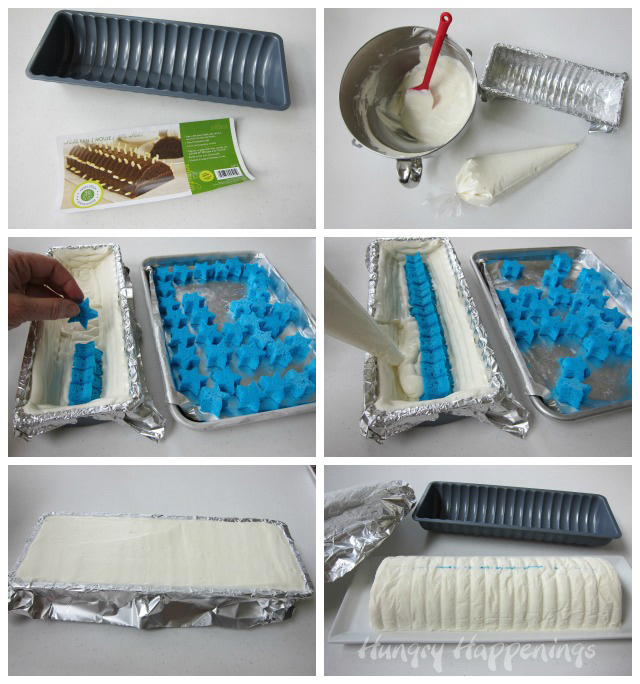 Spoon the ice cream into a large pastry bag or zip top bag. Pipe a thin layer of the ice cream into the pan. 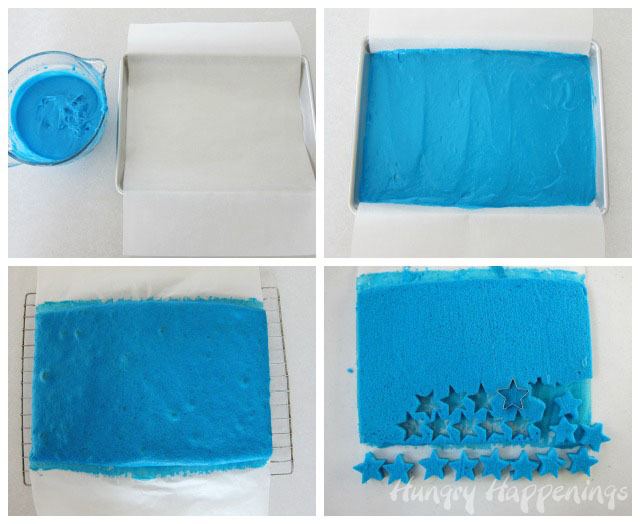 Arrange blue cake stars down the center of the pan, placing one of the five points down towards the bottom of the pan. 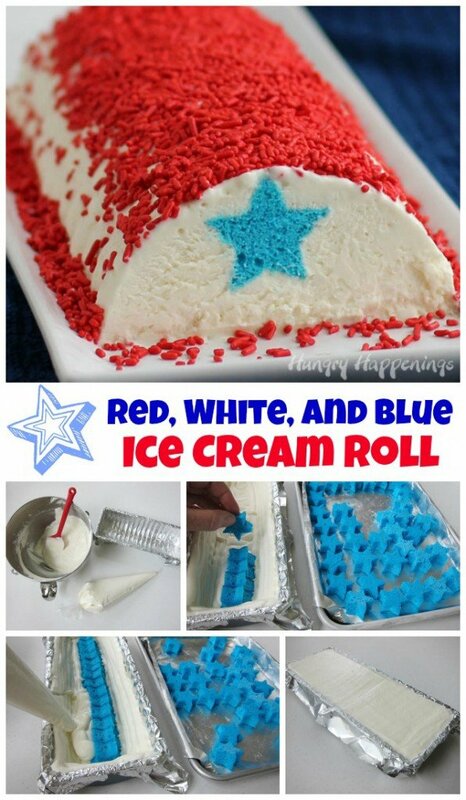 Pipe ice cream around and over top of the cake stars. Smooth out and place in freezer for at least 3 hours. You will have some extra ice cream. Just put it in a freezer safe container and freeze until ready to eat. To unmold, pull up on the tin foil, remove the ice cream log from the pan, set the log on a serving plate, and peel off the tin foil. Sprinkle red jimmies over top of the ice cream log. You’ll need to press them in around the sides in order to get them to stick. 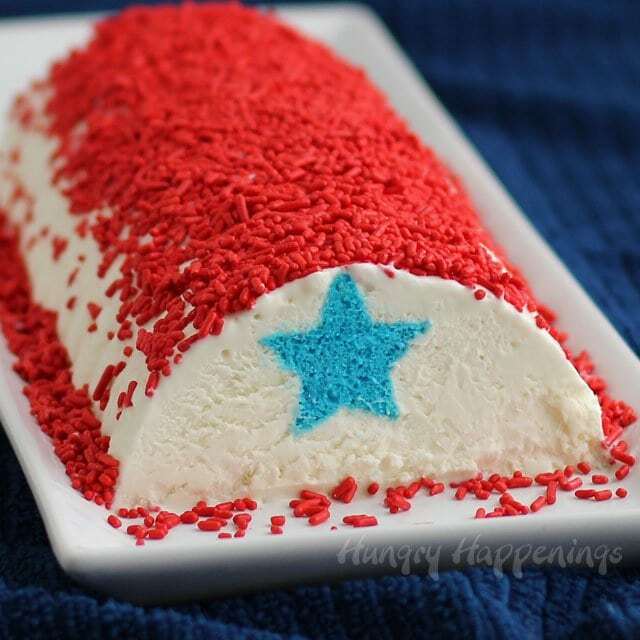 Cut a slice off the front of the ice cream log in order to reveal the blue star. 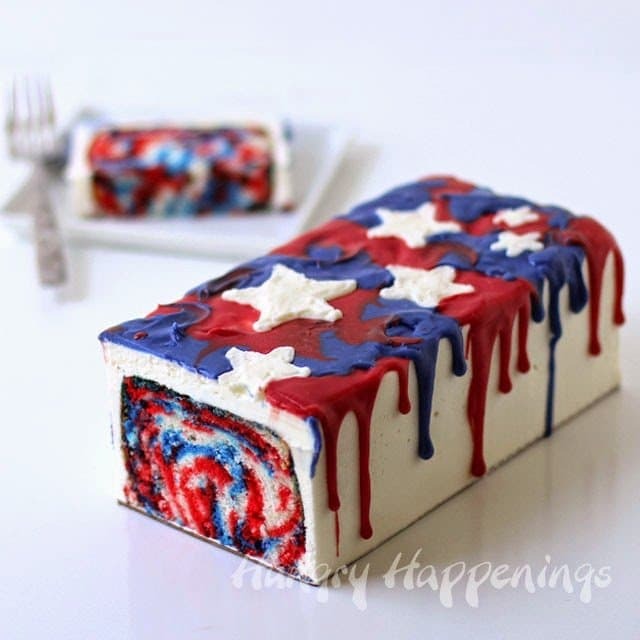 Red, white and blue ice cream cake roll!!! WOW this is a dessert I NEED! I'd scream for this Ice Cream, my family would love it! I'm serving this for our movie night tonight, and hope my friends all enjoy it! Thanks, this dessert does have that wow factor! Wow, that's a high compliment, indeed! 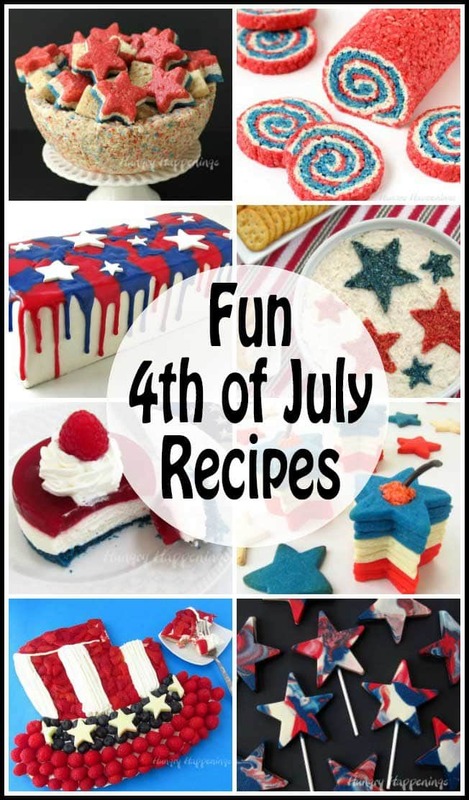 That looks so 4th of July amazing! Saw it and have to pin! Visiting from What's Cookin Wednesdays! Thanks for sharing. I'm so happy you stopped by! Have a great 4th of July. Love this! Definitely a fantastic way to celebrate!